Sarah Hartley has taken her own breakdown of local authority coverage in her local newspaper a step further by starting an investigation with collaborative website Help Me Investigate.com. People can sign up to the investigation at this link and submit information about newspaper coverage for different regions. The idea is to survey newspapers in all regions of the UK to provide a more robust picture of what local newspapers cover – in particular in light of debates surrounding competition from local authorities’ own ‘newspapers’ and public service reporting. This entry was posted in Editors' pick, Newspapers and tagged collaborative journalism, help me investigate, Investigate.com, local newspaper, Sarah Hartley, United Kingdom on September 10, 2009 by Laura Oliver. Who? Journalist and new media entrepreneur. What? He’s editor of the sports section in Portuguese local newspaper O Mensageiro. Contact? mail [at] jornalices [dot] com. This entry was posted in Recommended journalists and tagged #followjourn, editor, journalist, local newspaper, mail [at] jornalices [dot] com, media entrepreneur, O Mensageiro, Pedro Jerónimo on July 1, 2009 by Laura Oliver. A nice hyperlocal story in which Journalism.co.uk plays a wee bit o’ a role. A few weeks ago a good discussion got going at the Frontline Club on the future of regional media. In the audience, next to your very own Journalism.co.uk contingent (we didn’t quite out-number the ex-Press Gazetters) sat Jo Wadsworth, who started as web editor of the Brighton Argus in February. Now – as context – Jo Wadsworth had corrected one ‘Weige’ on Greenslade’s blog a little while back. Weige had it on ‘good authority’ that the Argus didn’t have an online team. Oh yes it does, retorted its new web editor. Fast-forward a few months: Greenslade’s comments at the Frontline got Wadsworth thinking. Wouldn’t it be good to get him to put his hyperlocal money where his hyperlocal mouth was, she cheekily joked to Journalism.co.uk afterwards. Go on… we egged her on. J.co.uk, for one, had been impressed by his local butcher knowledge over a drink in the bar afterwards. “So, dear readers, since I happen to live – at least part of the year, anyway – in the city of Brighton and Hove, I am planning to become the community reporter for the Kemp Town area of Brighton. And Greenslade? His patch is not exactly defined yet, he told Journalism.co.uk, but he has started to form some ideas. “I hope to take up topical issues raised by the people who live in what is a very diverse community, whether it be the proposals to develop the marina and the Blackrock shoreline or the continuing annoyance of litter and rubbish on the streets. And I expect to open a dialogue with the city’s councillors who represent the area. What do they do? Who are the community police officers, and how do they operate? “I want to highlight some of the characters who one sees on the streets and in the shops. I also plan to deal with some of the rich history of the Regency houses, which were originally homes to the titled, the famous and well-heeled. Though there are many blue plaques in this area, for example, many the names mean nothing to current residents. Who was Harrison Ainsworth, for instance, the man who once lived in the Arundel Terrace house where I have lived for 38 years? We’ll keep you posted with the link to Greenslade’s content when it goes live. Journalism.co.uk, also residents of Brighton, will definitely be making the most of his local contribution. This entry was posted in Journalism, Newspapers, Online Journalism and tagged Argus, Blackrock, blogger and resident, Bombay Bar, Brighton Argus, community correspondent, community reporter for the Kemp Town area, Frontline Club, Harrison Ainsworth, hyperlocal news, J.co.uk, Jo Wadsworth, journalism professor, Journalism.co.uk, Kemp Town, local butcher, local newspaper, online team, Roy Greenslade, the argus, web editor on April 20, 2009 by Judith Townend. Newspaper Death Watch rounds up trends for 2008, starting with the Gallup research that showed ’31 per cent of US adults now consult the internet daily for news while 40 per cent read a local newspaper’. This entry was posted in Editors' pick, Newspapers and tagged local newspaper, Rounding, United States on January 2, 2009 by Judith Townend. 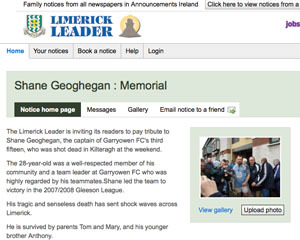 By creating an online version of the newspaper’s announcements page, the Limerick Leader has made its site the ‘focal point for entire community’s grieving,’ a press release from iAnnounce, the company which developed the page, said. More than 17,600 people have now visited the Limerick Leader’s iAnnounce page for 28 year old Shane Geoghegan, who was shot dead in Kilteragh, Ireland, at the weekend. Since the page was set up 36 hours ago, more than 8,500 ‘virtual candles’ have been lit and 2,000 messages of condolence written. “The unexpected death of such a popular man as Shane has affected this very close community,” said Alex Stitt, the managing director of iAnnounce, in the release. 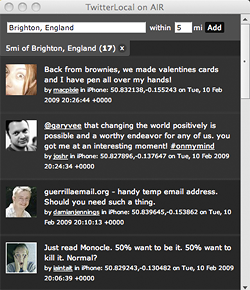 iAnnounce is used by various newspapers in the Johnston Press, Trinity Mirror and Newsquest newspaper groups, and was developed to make use social network tools for newspaper birth, deaths and marriages notices. This entry was posted in Newspapers and tagged Alex Stitt, iAnnounce, internet age, Ireland, Johnston Press, Johnston Press plc, Kilteragh, Limerick Leader, local newspaper, managing director, memorial By, newspaper groups, Newsquest, Newsquest PLC, online version, Republic of Ireland, Shane Geoghegan, social network tools, the Limerick Leader, Trinity Mirror, Trinity Mirror PLC on November 12, 2008 by Judith Townend. “Bergens Tidende, our local paper, has a shining example today of how a local newspaper can gather and report local news simultaneously by coordinating reader participation in a very easy-to-contribute mashup focusing on an issue of huge importance to Bergeners right now, though it’s of absolutely no wider interest”, writes Jill Walker Rettberg, an associate professor at the University of Bergen, on her blog. That issue is traffic: Bergen, a city on the west coast of Norway, is currently building a light rail system through Bergen, and the road works and constantly changing detours are causing major traffic problems. “We decided to do something different to report on the exasperating traffic situation in the city, ” Jan Stian Vold of Bt.no told me. What the news site came up with, in addition to their normal coverage, was a Google Map where readers could plot in where they encountered traffic problems. Walker Rettberg is also rather impressed by the anti-spam measures: “You enter your mobile phone number and instantly receive an SMS with a code that you then type into the website to confirm that you’re an actual person and that you’re a different person to all the other people who’ve entered their comments,” she writes. This works as an efficient way of identifying people as all mobile phone numbers are registered by law in Norway. Requiring users to register does raise the threshold for participation, but this has not deterred Bergeners, as around 400 people have reported their traffic problems so far, according to Vold. This entry was posted in Online Journalism and tagged associate professor, Bergens Tidende, BT, cellular telephone, google, Jan Stian Vold, Jill Walker Rettberg, local newspaper, Mapping, news site, Norway, Online Journalism Scandinavia, SMS, University of Bergen, Walker Rettberg, west coast on September 5, 2008 by Kristine Lowe.